Venus Beach hotel is a luxury five-star hotel with a beautiful coastal location in the region of Paphos. At just 12km from Paphos International Airport, guests will be luxuriating in their room within a few minutes of arriving in Cyprus. Rooms here are designed to make the most of the Cypriot sunlight with interiors that feature a light and carefully balanced colour palette. You can be sat on your private balcony overlooking the Mediterranean and enjoying a delicious drink or lunch as you soak in the atmosphere. It’s an easy jaunt down to Venus Beach being located as it is right on the beachfront. Paphos itself offers plenty of enjoyable things to see and do for families, couples and lone travellers alike. From a taste of ancient history at the Tombs of the Kings to a taste of traditional Mediterranean cuisine at a taverna and thrills at Paphos Waterpark, there’s something for everyone. 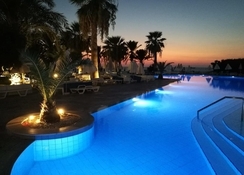 Being located in Paphos, the luxury Venus Beach Hotel is just 12km from Paphos International Airport. As the hotel’s name may suggest, it sits right along the beachfront, providing guests with wonderful views out across the Mediterranean Sea. There is an abundance of restaurants that those staying at Venus Beach Hotel will be able to walk to with ease, some of which combine allow you to combine great food with great sea views. A number of historical sights are all within a convenient 4km distance, such as the Tombs of the Kings, Paphos Archaeological Park and Mouttallos Cliffs. Paphos. Great shopping can be had at the centrally located Kings Avenue Mall, less than 3km away and Paphos water park is just 7km away or the equivalent of a few minutes taxi ride. You’ll immediately feel the indulgence of a stay at one of Venus Beach Hotel’s rooms, no matter what type of room you book. There are 216 rooms altogether, with views that include glorious mountains or the sparkling expanse of the Mediterranean Sea. As expected you’ll find all the basic amenities such as wi-fi, private bathroom, safe deposit box, air-conditioning, tea and coffee making facilities and among others with most rooms coming with a double bed and typically sleeping up to four people. Stand out rooms, however, include the Twin Side Sea View room with its views overlooking both the archaeological site, The Tombs of the Kings and the Mediterranean Sea and the Presidential Suite with a King size bed and separate lounge area. Guests can also dine in luxury too with a choice of superb on-site restaurants. Anemone Breakfast room features an elegant contemporary design with an international buffet. Nefeli Restaurant is where you can enjoy a delicious chef’s buffet of international and local dishes and Ariadne Restaurant also provides a variety of dishes as both a buffet and a la carte. You will also find three bars including the Bacchus Bat which has live music on several nights of the week. Nearby Venus Beach Hotel visitors will find great Indian cuisine at Koh-i-Noor, delicious steak at Oliveto Steakhouse as well as plenty of traditional Cypriot tavernas and bars which overlook the Mediterranean. There’s plenty of things to do around the clock in and around Venus Beach Hotel. 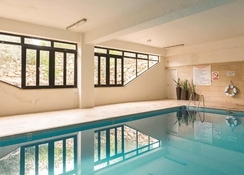 Take a dip in one of the swimming pools, grab a racket and head down to the tennis court, keep up your exercise regime at the gym, relax in a jacuzzi or laze about on the nearby beach. Children aged between 4 and 12 years will love the seasonal Kid’s Club as well as the playground. In the evening guests can be entertained by live music and theme nights. Combine cooling off with great family fun and head to Paphos Waterpark, 7km south of the hotel and soak in a little history at the Tombs of the Kings and Paphos Archaeological site. My only complaint about the hotel was the lack of facilities to make tea or coffee. When I requested a kettle, I was told that this was only supplied to the premier rooms, which seemed very penny-pinching. The pool area was fine except for the constant blaring pop music, or worse still, rap, which struck me as being for those of limited intelligence, or appreciation of music.